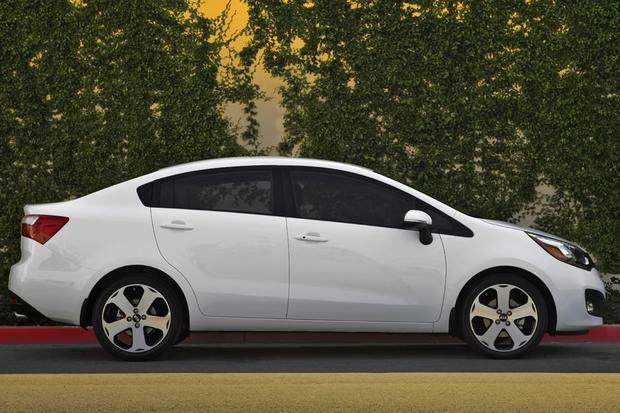 The 2019 Kia Rio offers frugality and affordability in a stylish and nicely equipped small car with a great standard warranty. Video | 2018 Kia Rio: What's New? Here's what's new on the 2018 Kia Rio. The 2018 Kia Rio has a value that's hard for the competition to match. We're taking a closer look. Here are 14 cheap new cars and SUVs (plus a minivan and pickup). Low prices, ample space, equipment and general quality were considered. 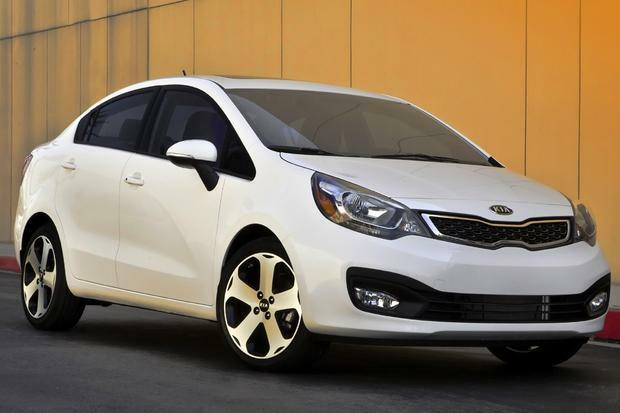 The 2014 Kia Rio and Kia Rio5 may be inexpensive, but you wouldn't know it to look at them. Where most subcompacts look like bargain-basement rental cars, the Rio and Rio5 show off a bold and sporty appearance. And they are loaded with standard and available features, offer horsepower and fuel economy near the top of their class, and come with a 10-year/100,000-mile powertrain warranty at no charge. Buyers can opt for Rio sedan (4-door) or Rio5 hatchback (5-door) models, and even the most basic LX version includes such cool features as a 4-speaker stereo with USB/iPod port, steering-wheel-mounted audio controls, air conditioning and a 6-way adjustable driver's seat, all for less than $15,000. More impressive than the Rio's low price is the technology packed under the hood. Kia has equipped the Rio with a gasoline direct-injection engine and an advanced 6-speed automatic transmission (a 6-speed manual is standard). The Rio and Rio5's advanced design, impressive fuel economy and low price haven't attracted just our attention. The resale-value guidebooks have noticed too, elevating the Rio's once anemic resale value to fairly respectable levels, though its still not as good as those for the Honda Fit or Ford Fiesta. For 2014, Kia adds body, engine and rear bumper under covers that help improve aerodynamics. A revised smart key fob includes a folding key design, and the instrument cluster gains a water temperature gauge. 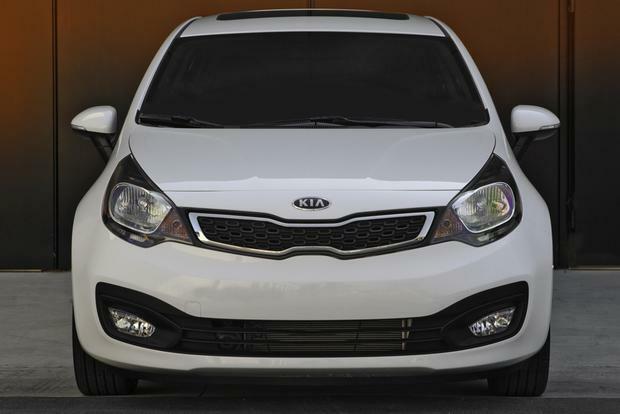 Both the Kia Rio and Rio5 derive their power from a 1.6-liter gasoline direct injection 4-cylinder engine that makes 138 horsepower and 123 lb-ft of torque. That may not sound like much, but in a car as small as the Rio that's teamed with a modern 6-speed automatic transmission (the 6-speed manual is available only on the base LX), it's enough to deliver a performance that feels peppy. The 1.6-liter is very willing, but it's also loud at full throttle. Yet, on the open highway, the Rio's fuel economy of 37 miles per gallon will make that loudness music to your ears. Expect around-town figures to be slightly lower at around 27 mpg. With the Eco Package, Kia's ISG (Idle Stop and Go) is standard equipment. This feature shuts the engine off at idle and restarts it once the accelerator is depressed, helping raise fuel economy to 28 mpg city/37 mpg hwy. 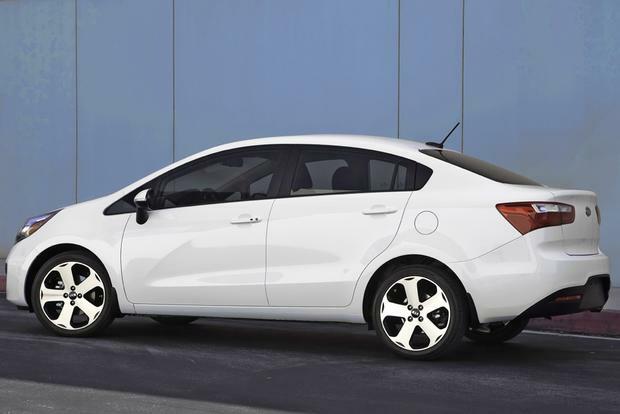 Both the 2014 Kia Rio and Rio5 come in three trims: LX, EX and SX. Only the LX offers a choice between a 6-speed manual or a 6-speed automatic transmission. The Rio LX ($14,600, sedan; $14,700, 5-door) includes a 6-speed manual transmission, 15-inch steel wheels with covers, heated power side mirrors, rear defroster, rear wiper/washer (5-door), AM/FM/CD/MP3 stereo with satellite radio and USB/auxiliary inputs, steering-wheel-mounted audio controls, a tilt steering column, air conditioning, a 60/40 split folding rear seat and cloth seating. The Rio EX ($17,500, sedan; $17,700 5-door) gains a 6-speed automatic transmission, power windows, power locks, keyless remote entry, Bluetooth, cruise control, A-pillar mounted tweeters, a tilt/telescopic steering column and premium cloth seats. The Rio SX ($18,600, sedan; $18,790, 5-door) adds a sport-tuned suspension, ventilated front disc brakes, 17-in alloy wheels, power-folding side mirrors with turn signal indicators, fog lights, LED taillights, UVO infotainment system, a rear backup camera, steering-wheel-mounted paddle shifters, auto on/off headlights and a soft-touch dash pad. Options for the LX are limited to a 6-speed automatic transmission, power windows, power locks and keyless entry. The EX can be equipped with the Convenience Package that adds UVO, front fog lights, power-folding side mirrors, touchscreen monitor with rear backup camera, auto on/off headlights, leather-wrapped steering wheel and shift knob, and alloy wheels. The top-of-the-line SX trim can be equipped with the Premium Package that brings navigation with SiriusXM Traffic, push-button start with Smart Key, a power moonroof, heated front seats and leather seating surfaces. Every Rio and Rio5 comes standard with front, front side-impact and front and rear side-curtain airbags. Also standard are 4-wheel ABS, electronic traction control and electronic vehicle stability control. The National Highway Traffic Safety Administration (NHTSA) rates both the Rio and Rio 5 with four out of five stars for overall safety. However, while the Rio did earn five stars in its side-impact test, the rear-seat passenger dummy suffered what would be considered a high lower-spine acceleration event, causing NHTSA to place a warning for possible thoracic rib injury to the rear-seat occupant. Keeping in mind that this is a small commuter car, we are impressed by the way the Rio rides and handles. The LX and EX versions have smaller 15-in wheel and tire packages that help keep the cabin quieter and certainly deliver a softer ride than the SX trim's 17-in wheels. But the smaller wheel and tire combo also delivers only average cornering ability, with lots of squealing when the tires are pushed hard and an almost constant need for stability control. The SX does better, delivering more grip and a more stable driving experience. No Rio is particularly quick, but we do like the LX's 6-speed manual and wish it was available on the sporty SX. Since it is not, most will find the 6-speed automatic with manual shift control almost as fun and certainly as efficient, since both manual and automatic achieve identical fuel economy ratings. Chevrolet Sonic -- The Sonic is about the same size as the Rio and Rio5, gets slightly better fuel economy and can be equipped with a turbocharged engine that makes it much more fun to drive. 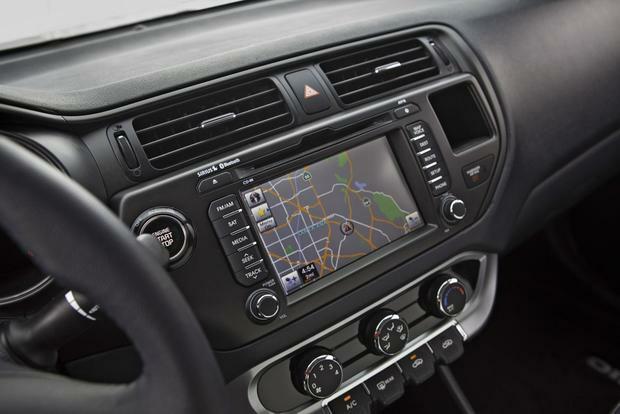 The Rio, on the other hand, has a better warranty and offers more advanced technology and audio options. Honda Fit -- The Fit offers more interior room, but its boxy hatchback styling isn't as handsome as the Rio5's, and its warranty isn't as long. Although the Fit's resale value is superior to the Rio's, the Rio gets better fuel economy and has a more powerful engine than the Fit. Nissan Versa -- The Versa may not win any beauty contests, but it will walk away with best in class for interior room and comfort honors, as well as lowest base price and best fuel economy. The Rio may not have as big a back seat, but it does have more features and a longer standard warranty. The choice between Rio sedan and Rio5 hatchback is up to you. Visually, we like the sedan's proportions, but for functionality the 5-door hatchback is the more logical choice. Whichever model you pick, we'd opt for the EX, which has all the features you'll need. With the $1,000 Convenience Package, which adds the SX's UVO information and entertainment system, power-folding mirrors and a backup camera, the price is still well under $20,000.